Cincinnati Bearcats forward Justin Jackson (5) works against the Middle Tennessee Blue Raiders forward Shawn Jones (12) in the second half at FifthThird Arena. CINCINNATI — It’s amazing what a little offense will do for a basketball team. No one questions the ability of the Cincinnati Bearcats to defend opponents but it always feels better when shots start falling through the net. The Bearcats felt a whole lot better about themselves after the second half of Saturday’s 69-48 win over Middle Tennessee State at Fifth Third Arena. UC scored 48 points after halftime, equaling the most it has scored in a single half this season, while making 17 of the 28 shots it took. The Bearcats had 11 of their 16 assists in the second half. It was an offensive explosion, no doubt, but it started with a fundamental staple of UC’s game. "That starts with your defense," said head coach Mick Cronin. "It starts with taking away what they’re trying to do, pressure on the ball, getting in the passing lanes." UC held the Blue Raiders to 26.7 percent shooting from the field and out-rebounded them 37-30, including 20-9 in the second half. MTSU had a 9-0 edge in second chance points in the first half as the teams were tied 21-21. 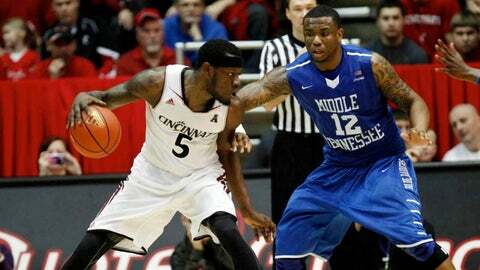 UC flipped that to 11-4 in the second half and held MTSU to just two baskets on the fastbreak the entire game. This was a solid MTSU team that UC manhandled in the second half. The Blue Raiders (8-4) were an NCAA tournament team last season and their previous losses have been to other 2013 tournament teams: at Florida, against Belmont and at Mississippi. UC held leading scorers Shawn Jones and Neiko Hunter to a combined 11 points, or 15 points under their combined averages. Bearcats allowed New Mexico and Xavier to shoot at least 50 percent from the field in consecutive losses. In beating Pittsburgh 44-43 on Tuesday and in Saturday’s win, the Bearcats allowed a combined 28.8 field goal percentage. Sean Kilpatrick equaled his season high with 23 points, 16 of them coming in the second half on 6-of-10 shooting, while Justin Jackson had his third double-double of the season with 16 points and 12 rebounds. The rebounds equaled a career high, as did the four steals he had. It was the contributions the Bearcats got from the rest of the roster that proved the difference. Kilpatrick is going to be the focus of any defense UC faces. "I pay that no attention at all," said Kilpatrick. "I just really worry about getting everyone else involved and I worry about winning. Get everyone involved and once they see everyone else hitting and everyone else scoring, of course they’ll start leaning back on me and that’s when I’ll take my chances. I really just let the game come to me and let everyone else do their thing." No one was really doing much of anything in the first half. It was the fourth consecutive game the Bearcats failed to score more than 25 points in the first half. Forwards Shaquille Thomas and Jermaine Sanders didn’t score, combining for just one shot attempted. The pair had 13 points on 4-of-7 shooting in the second half. Thomas started but sat on the bench the final 14:48 of the first half because he wouldn’t shoot. "Just shoot when you’re open. I’m sick of taking guys out of the game for not shooting," said Cronin. "I’ve never done it as much as I have (this season). Usually I take guys out for not playing defense, but with this team, Troy Caupain, him and G (Ge’Lawn Guyn), they keep coming out of the game because neither one of them will shoot when they’re open. "If you don’t shoot when you’re open you’re going to drive into the defense and they’re going to steal it. This game isn’t that complicated." Thomas was back on the floor to start the second half. He had an offensive rebound that led to a Kilpatrick 3-pointer and his own conventional 3-point play in the first two minutes of the half. "Shaq is talented in many ways," said Jackson. "He’s 6-7 playing the two and the three. There’s not too many guys in college playing the two and three at 6-7 and he can move. Shaq can bring a lot to the table and the way you saw Shaq play in the second half is what we’re used to and what we expect out of Shaq." Kilpatrick is the only player who is in the same role as he was a season ago for the Bearcats. Caupain, Kevin Johnson and Jermaine Lawrence are freshman getting significant minutes in the rotation. The Bearcats are a work-in-progress. That’s especially true on offense, but it was just a step in the process. "My job, for us to realize our potential, is to develop our younger players," said Cronin. "That’s the answer. And keep developing Justin in the low post, because you’ve got to have answers when other teams score. You’ve got to answer them back. Jermaine Sanders knocking down some shots, Shaq Thomas going to the rim and finishing, those are big plays for us. I believe our three freshmen have tremendous talent. Now, we just have to keep developing them."